While most of us may not have been aware April 2 was National Peanut Butter and Jelly Day, for Adrian M. Silversmith, it was the biggest day of the year. And his career. Nestled inside the Made in Virginia Store in Downtown Fredericksburg, Virginia, Adrian fittingly opened Sprelly, a sandwich counter offering gourmet PB&J sandwiches and crepes, to celebrate the foodie holiday. What started three years ago as an idea soon grew into a farmer’s market staple in the area before it became grounded at the brick-and-mortar location on Caroline Street. Sprelly founder Adrian Silversmith at his recently opened sandwich counter. I visited the shop around 2pm on a weekday, hoping to avoid a lunch time rush. Adrian was immediately recognizable to anyone who had visited Sprelly’s website or followed the business on social media, except he wasn’t wearing his trademark fedora. Lining the sandwich counter were tubs of nut butter in a variety of flavors: white chocolate almond butter, honey roasted peanut butter and a sweet Thai chili peanut butter. But before I got to try the food, I sat down to hear the story of how Sprelly developed. Although he had an idea and a name for the business, Adrian put Sprelly on the back-burner and focused on his day job working at the local expo center. Only a few weeks later, though, he was let go as the company looked to downsize. Sprelly’s sandwich counter is tucked into the Made in Virginia store on Caroline Street in Fredericksburg, Virginia. Over the next six months, Adrian began to research everything from nut butter production to possible competitors. He studied business for a few years in college, but switched to theatre after almost failing out his sophomore year. Before he continued telling his story, we were interrupted by a customer who came over to say hello after purchasing a few nut butters. She and her husband were participating in a long-distance bike race to raise money for MS research, and she made sure to pick up their favorite flavors from Sprelly to provide energy during the race. To say Adrian is a people person would be an understatement. His background in theatre becomes apparent as soon as he begins a story or interacts with a customer. Launching back into our conversation, Adrian tells me about how he pitched Sprelly at the “Made in FredVA” Business Plan Competition, where he didn’t win the grand prize but was voted the “People’s Choice.” A few weeks later, he entered a weekend-long startup competition where he worked with a small team of people to take home the “People’s Choice” once again. 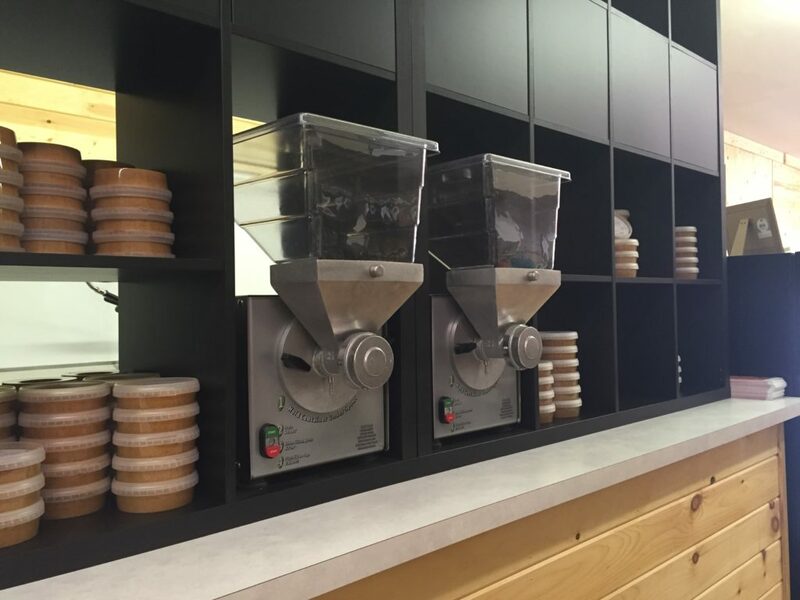 In addition to fresh crepes and sandwiches, Sprelly offers containers full of nut butters in a variety of flavors. All made by Sprelly’s employees using grinders like these. Sprelly’s first sale was made in the same expo center where Adrian had been let go. During an expo geared towards kids, Adrian brought his grinder and little plastic containers (think ketchup containers at a fast-food restaurant) to sell samples. He quickly sold out. That summer, Sprelly became a regular fixture at half a dozen farmer’s markets in the area. In addition to selling batches of nut butter, Adrian and his team began to make sandwiches and crepes for their customers. 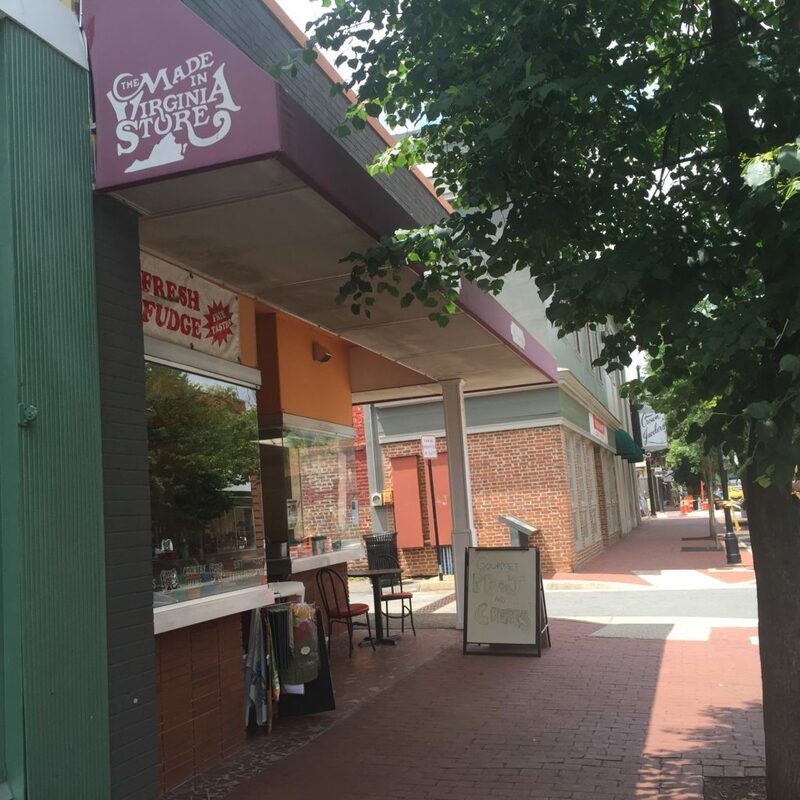 But when the sandwich counter at the Made in Virginia Store was vacated, Adrian knew this was his chance to have a prime Caroline Street location, one of the most popular streets in Downtown Fredericksburg. He signed the lease for the space in the fall of 2014, but the opening of Sprelly was delayed after issues with the design and layout of the space. By the time Adrian sorted out the problems, it was already April, and the farmer’s markets were opening again. In addition to the options offered on the menu, customers are welcome to create their own custom crepes and sandwiches. 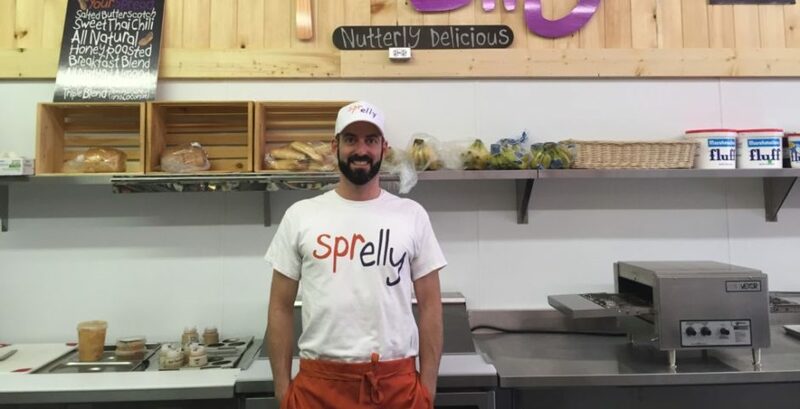 Construction began in February of this year, and Sprelly officially opened with a “Sprellyfest” celebration on National Peanut Butter and Jelly Day. 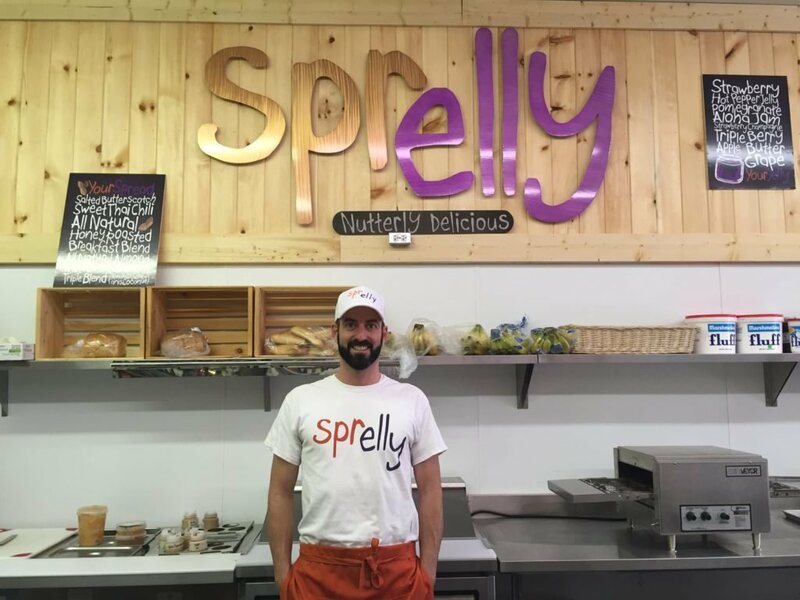 Now, a few months since the grand opening of the brick-and-mortar store, Sprelly is still a staple at local farmer’s markets and has become a fan favorite in the Downtown community. 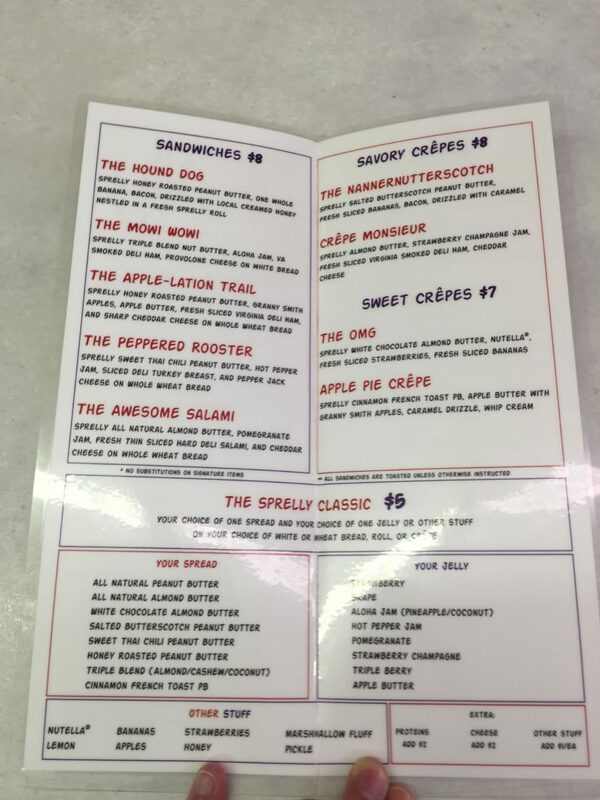 According to Adrian, The OMG crepe is the most popular item on the menu, but I was drawn to the Apple Pie Crepe featuring Sprelly’s cinnamon french toast peanut butter. While he began to make my crepe, he tells me about his newest promotion: Late Night Crepe Nights. From 9pm to 11pm on the weekends, Adrian serves up fresh crepes out a drive-thru style window to pedestrians enjoying the Fredericksburg nightlife. 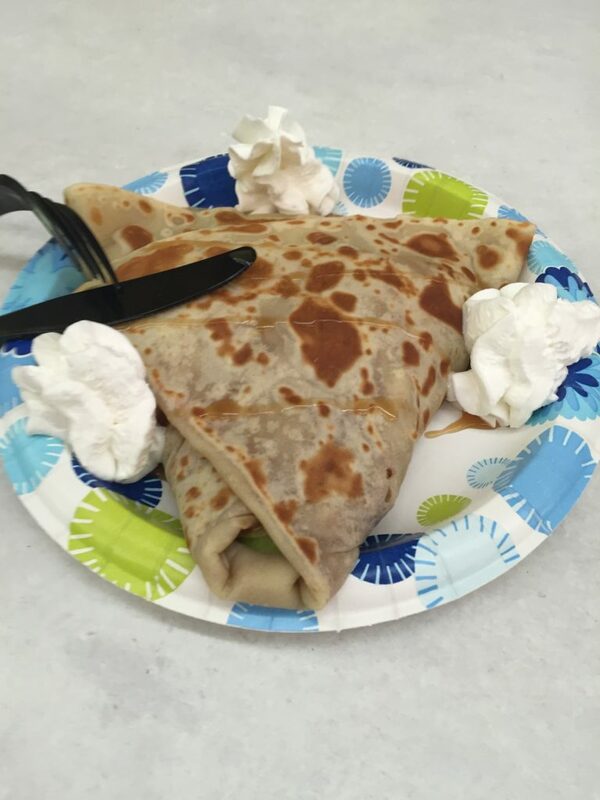 Apple Pie Crepe: Stuffed with apples, cinnamon peanut butter, apple butter, and caramel. After a few minutes, Adrian presented me with my order and proceeded to offer up as much whipped cream as I want. Before I even took a bite, I could smell the cinnamon and caramel. With sliced Granny Smith apples wrapped in a warm crepe, it really did taste like an apple pie. By the time I had finished devouring all that was on my plate, I felt delightfully full – like I was ready for a warm glass of milk and then bed. Before I left Sprelly, however, Adrian was sure to offer me a spoonful of the other nut butters so I could taste them all. If I hadn’t already been stuffed by the Apple Pie crepe, I would’ve been tempted to order The Peppered Rooster, a savory sandwich featuring turkey, pepper jack cheese, hot pepper jam and sweet Thai chili peanut butter. With a full stomach and a promise to return soon, I left Sprelly with a new favorite lunch spot and a tub of nut butter to share with my family.